Hibike! 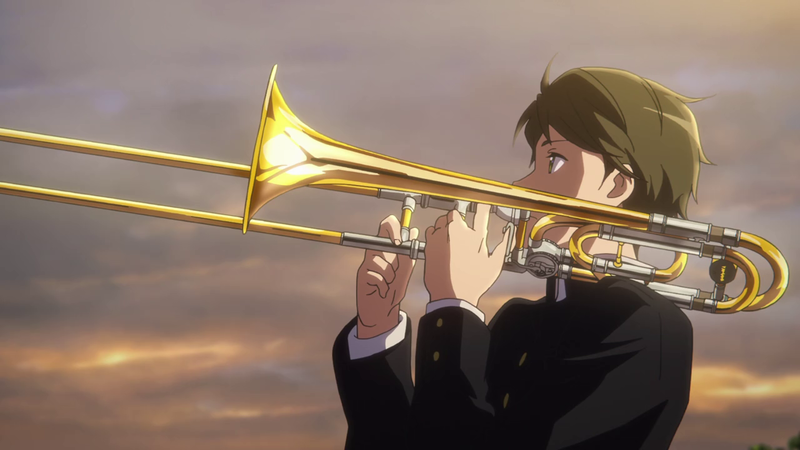 Euphonium takes a break from anything really band-related this episode, resulting in what is most probably the best episode in the series thus far. I’ve praised Hibike! Euphonium before for portraying and emulating high school emotions in realistic and unique ways, and I think this episode shows off what I’ve saying perfectly. There are a variety of relationships and character interactions that are played off of, and it’s effective now that we’ve been given time to get to know each of the characters. Even the simple, tried-and-true love triangle sees some complexity, and while there’s plenty of love flying around in the air, the real stars of the episode are, of course, Kumiko and Reina. Whether you interpret it as love or extremely heavy yuri overtones, you can’t deny that there’s an immense amount of tension between the two, forming a large backbone of the series since the beginning of episode 1. The chemistry between Kumiko and Reina shines through, as we see Kumiko acting in a way we don’t usually see. Reina even calls out Kumiko’s social awkwardness, something I’ve alluded to before and something that other characters like Hazuki and Midori don’t talk about. 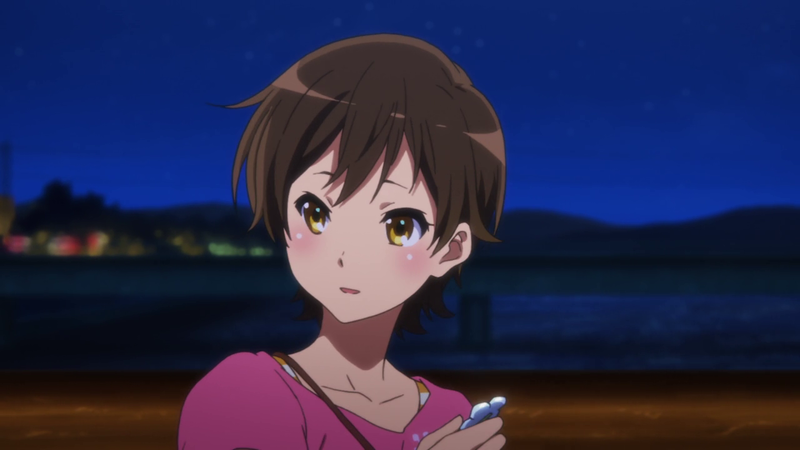 Thankfully for Hazuki, Kumiko has no romantic interest at all for Shuichi, something we can surmise from the fact that she declines his offer to practice together, given the excuse that her euphonium is too heavy. However, when Reina asks her the same thing, Kumiko climbs a mountain with it without too much hesitation. 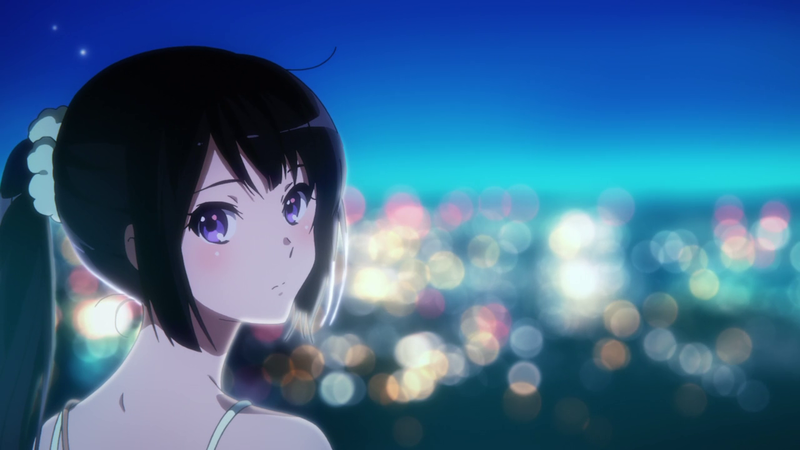 What follows on the mountain’s top is a scene more beautiful than most with even canon, hetero couples, and while an actual relationship will most likely never blossom between Kumiko and Reina, what IS there is no less strong than anything in Free! Anyone who knows me knows that I find romance in anime really boring, so why am I so worked up over this? Is it because it’s two girls? Maybe. While it’s hard to believe, my preference for yuri ships stems less from perversion and more from the stance that I believe men in anime to be largely disingenuous when it comes to love. I’m aware that’s a horribly sexist comment, and I’m throwing my fellow fellows under the proverbial bus, but it is what it is. That aside, I guess at the end of the day, I’m fascinating by the relationship between Kumiko and Reina. I mention it earlier, but it’s really all about the chemistry. We have two genuinely interesting and multi-faceted characters who are interested in each other. Reina appears to be aloof but is actually brutally honest, while Kumiko, as Reina observes, has the face of a completely normal girl but is actually socially awkward. The two bring out different, complex sides from each other, and I’d love to see more of this dynamic in the coming episodes. The presentation this episode is more stellar than normal, particularly the ending segment featuring Kumiko and Reina playing a duet of Hanako Oku’s “愛を見つけた場所” (“Ai wo Mitsuketa Basho” or “Where I Found Love”). Hearing the warm countermelodies flowing together over shots of all of the club members together, as well as the gut-punching shot of Hazuki crying, is a perfect, heartfelt way to close a great episode. I know I’ve been bad about linking concert band pieces for the past few weeks, so this week I’m giving you all a recording of Hanako Oku’s “Ai wo Mitsuketa Basho.” It starts at 21:45.
in the novel kumiko does end up with shuichi and reina has a crush on the music teacher and I highly doubt the creator gave the a ok to kyoani to make her two characters lesbians for whatever reason if the studio is going by the novel that is.